Are you looking to stand out from the crowd with a one-of-a-kind piece? To cover up that plain and boring wall, invest in a piece of unusual wall art. It can be anything from paintings and photographs and collages, sculptures and reliefs. Whatever tickles your fancy. Here, we highlight five materials that make for unusual art. Go ahead and shop the good, the interesting and the bizarre. Why not take your wall art one step further and buy something gold and fancy? Many Artfinder artists experiment with gold leaf to make their art three-dimensional and shiny. What more could you want in a statement piece? Artfinder bestseller, Martina Boycheva, frequently uses gold leaf in her abstracts for that extra bit of sparkle. Finding random items in thrift shops, recycling already used objects or even salvaging items from garbage and transforming them into fine art: You can’t get any more unusual or unique than that. Fabrics, paper, newspapers and found objects are all fair game in mixed media art. Juliette Belmonte’s artwork found objects, tissue paper, fabric and newspaper to create her collaged ladies. Pick from the wildest and brightest abstracts on Artfinder. Abstracted landscapes or cityscapes are kicked-up a notch with the inclusion of a few surprise materials such as sand, grout or even sponge. Incorporate one giant piece of unusual wall art as a statement piece, or a few smaller pieces of contrasting texture to make up a gallery wall. Nicole Cijs uses grout (not from the shower) and sand to get that rough, three-dimensional look for her soothing abstracts. When you hear ‘unusual art’, you may think of more creative art mediums like sculpture. Take it a step further with ready-to-hang sculptures or reliefs. These puppies will come to your door ready to add some pizzazz to your home. Wall or not, if you have a space in your home looking to be filled, Lee Jenkinson’s inaccessible architecture series uses salvaged wood, slate and wire to construct his dreamy tree house sculptures. Collages can range from naive, whimsical scenes to political commentary. 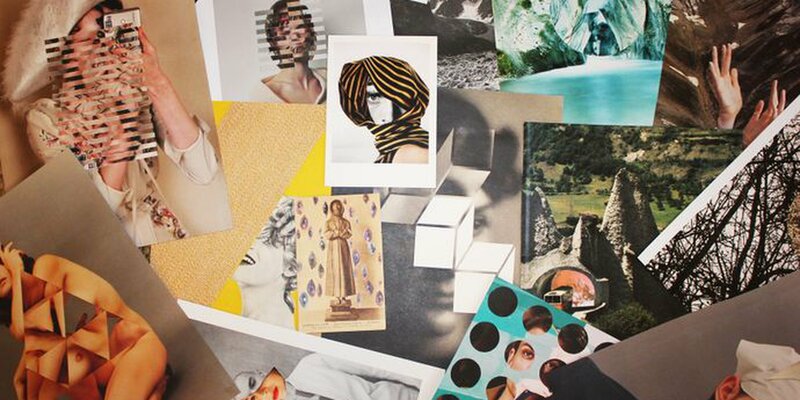 Collages are one of the most versatile mediums and can include magazine and newspaper clippings, photographs, paper, rope, hair - anything you can imagine. Take a look at Victor Tkachenko’s collages and spot the many photographs incorporated within the eyes and swirls of paint. It’s a maze! Do you find yourself in a bit of a pickle when you try to buy art online? Read on to discover our tips on incorporating artworks into your home. Chances are, you’ve used the word ‘modern’ to mean ‘contemporary’ and ‘contemporary’ to mean ‘modern’. Potato-potarto, eh? Well, when it comes to art, it’s more like potato-tomato.